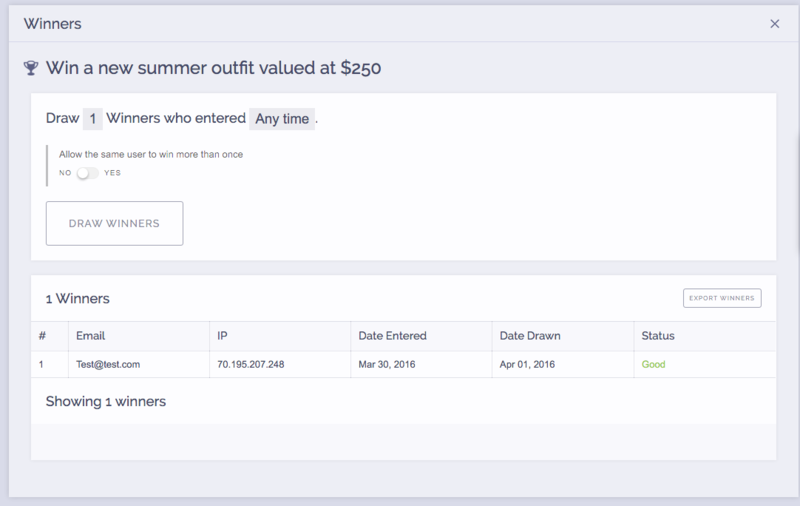 This documentation will explain in detail how to draw winners for your promotion. See the video below for an overview on how to draw winners. 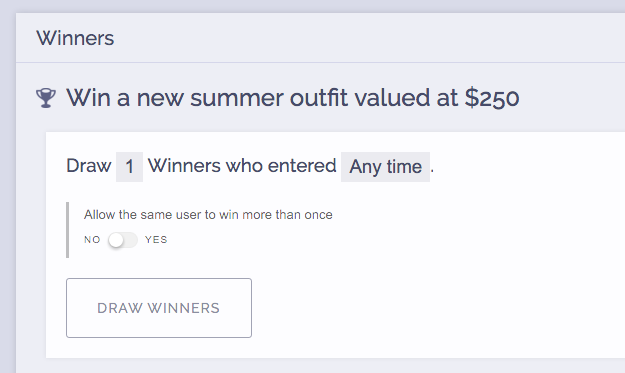 When you hover an active sweepstakes in your dashboard, you will see the winners button. Click this to activate the winners tab. You can draw winners at anytime when running a sweepstakes. This enables you to draw winners hourly, daily, weekly, or at the end of your sweepstakes. When the winners tab slides out, you can choose the number of winners you want to draw, and the time period you want to draw them from. Simply click on the number to change the number of winners to draw. By default the time period will be set to "Any time" which is the entire duration of your promotion. If you want to draw winners from a different time frame, simply hover "Any time" and choose from the calendar. Before clicking the draw winners button, you have the option of allowing our system to draw the same person more than once. This is typically used if you had a daily entry sweepstakes and allowed people to win more than once. Simply toggle this feature on if you want to use it before drawing your winners. When ready, click the draw winners button and your winners will be randomly drawn and shown to you in the table below. How do I delete a winner or choose another winner? If for some reason you need to delete a winner and choose someone else, simply hover the "Status" section and click delete on the winner. Then go back through the process of drawing another winner. ViralSweep has a fraud detection system in place, so if the system draws a winner and you see the orange caution label that means that particular person triggered our fraud detection system and you should inspect that winner further. Often times, if your spam settings are set to allow multiple entries from the same IP address, this will trigger the spam filter. You can ignore the caution label, but we are just informing you that we detected this person had attempted to enter multiple times, or some other form of fraud was detected. I randomly selected my winners, now what? You can export their information by clicking the export winners button and then you can contact them via email or phone (if you collected a phone number from them). Will you contact my winners? No, we will never ever contact your winners for you. No, we will not send them an email either. After you draw your winners we will provide you with their information and you will need to reach out to them directly. Can I draw daily winners? 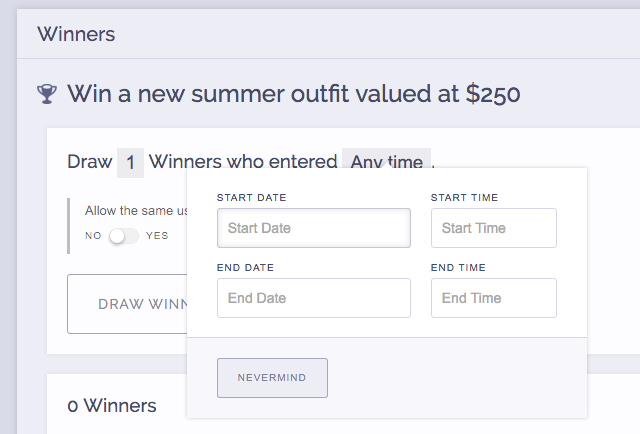 Yes, you can draw winners whenever you would like by simply going to the winners tab and choosing the number of winners you want to draw and the date range that you want to draw them from. I made a mistake when drawing my winners, now what? Don't fret, no one is notified that they won. If you made a mistake while drawing a winner, simply delete that winner and re-draw new winners. Still having trouble with drawing winners? Simply click the support or live chat icon to get in touch with us.